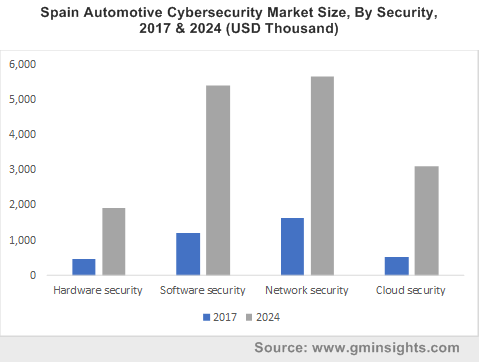 Automotive cybersecurity market to witness a staggering CAGR of 23.5% over 2018-2024, collaborations and JVs to characterize the strategic landscape « Global Market Insights, Inc. In an era where connected cars are deemed to mark the future of mobility, automotive cybersecurity market is indeed set to occupy a pivotal stance in smart and sustainable tech space. The cyber threats or security breaches in connected cars enable external access to the vehicle’s network and not just compromise the driver’s data privacy but can also pose serious threats to the driver’s physical safety and car’s operation. With data security breaches becoming intensely sophisticated, automotive cybersecurity industry has turned out to be an inevitable investment spot that would aid automotive sector’s continued roadmap toward connectivity without risk. The dynamics of automotive cyber security involves two major rationales; the product’s design, developments, maintenance, and operations and the operating environment comprising the regulatory and strategic framework. The multiple aspects associated with the two parameters are sort of prerequisites for the automotive cybersecurity market players to enhance and expand their stance in this landscape. Speaking of competitive trends, strategic collaborations and partnerships have emerged as two of the top-notch measures adopted by the automotive cybersecurity market giants. One of the recent trends in this regard has been the JVs established between the automotive companies and technology conglomerates, in a bid to understand and resolve the security complexities in modern or connected vehicles. One of the recent instances that validates the growing stance of collaborations & JVs as prominent growth tactics has been the partnership between SafeRide, one of the formidable automotive cybersecurity market players and Netherland based digital platform security giant, Irdeto. Under the terms of the recently inked partnership, SafeRide in collaboration with Irdeto is claimed to provide the OEMs and tier -1 automotive suppliers with a holistic cybersecurity solution for autonomous and connected vehicles. Allegedly, SafeRide’s flagship vSentry solution would be integrated with Irdeto’s famous Connected Transport solution, Cloakware, to offer a multi-layered approach in protecting the platforms against tampering, automated attacks, and reverse engineering. The aforementioned instances only bear a fraction of the developments underlining automotive cybersecurity market, which as per Global Market Insights, Inc., would surpass a valuation of USD 837 million by 2024. The growing deployment of in-vehicle connectivity such as infotainment services, navigation, mobile phone connectivity, voice recognition, and communication in modern vehicles has further allowed the automotive cyber security market to make profound inroads in consumer vehicle segment. As per estimates, this particular application segment procured almost 90% of the global share in 2017. Not to mention, the collaborative approach of the governmental agencies and with software players to provide telematics cybersecurity solutions is another prominent factor characterizing the automotive cybersecurity industry outlook. In May 2018, The Department of Homeland Security Science and Technology Directorate partnered with the Volpo National Transportation Systems, a subsidiary of DOT, with an aim to build an efficient operational network and cybersecurity implementation for telematics systems in Federal vehicles. In yet another instance, Red Balloon Security, the globally acclaimed embedded security technology leader and Auto-ISAC had recently announced the commencement of a new partnership. The two entities through this tie-up intend to provide advanced security tools and training programs to spread cybersecurity awareness in the automotive sector. Red Balloon Security’s advanced specialized tools and trainings are expected to help professionals deal with potential cyber threats in vehicle embedded device systems in a much comprehensive way. Powered by the dynamism in the growth portfolio, investors are highly optimistic toward the revolutionizing automotive cyber security market outlook and are betting big to exploit the potential opportunities it is likely to offer. The renowned Japanese automotive component manufacturer Denso’s USD 2 million investment in Dellfer, the renowned cybersecurity and IOT giant this year marks the onset of this approach by the automotive sector. The deal also implicates the rising focus of the auto giants toward protecting the connected vehicles from potential and rather sophisticated cyber threats. It is overt that with the increasing commercialization of autonomous and connected vehicles, the deployment of cybersecurity technologies is deemed to be humongous. In terms of profitability, the global automotive cybersecurity market is slated to record a double-digit growth rate over 2018-2024. This entry was posted in Sustainable & Smart Technologies and tagged Automotive Cyber Security Companies, Automotive Cyber Security Market, Automotive Cyber Security Market Outlook, Automotive Cybersecurity Market, Automotive Cybersecurity Market Size, Cloud Security, Commercial, Communication, Consumer Vehicles, Global Automotive Cybersecurity Market, Hardware Security, Infotainment, Network Security, On-board Diagnostic, Passenger Vehicles, Safety Systems, Software Security, Telematics.